With the Atlantic hurricane season about to kick into gear, plenty are wondering how this year's crop of storms with disarmingly mundane names will compare to last year's nightmarish season. This map goes even further, showing the past 170 hurricane seasons. It's beautiful and humbling, all at once. 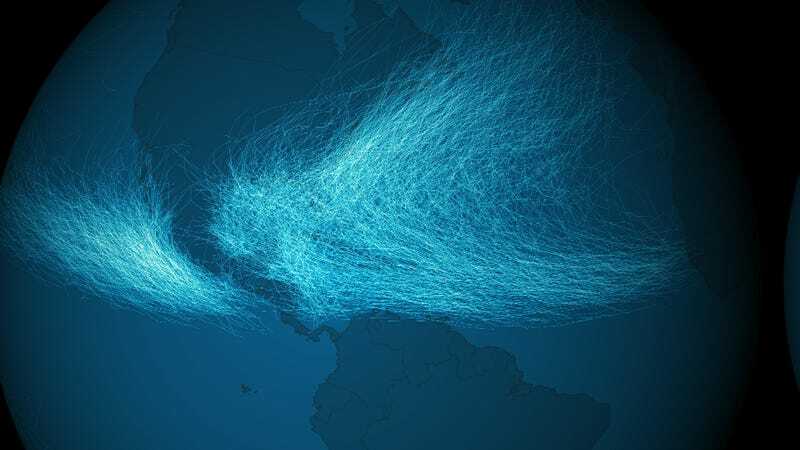 The Visualization Lab at the National Oceanic and Atmospheric Administration posted this new map on Friday, charting 11,967 tropical cyclones that have occurred on Earth since the NOAA began keeping a record in 1842. Back then, data collection was far less reliable, coming from ships and lighthouses all over the world rather than satellites. So this map is likely missing hundreds of hurricanes that were never noticed (or reported). "Geostationary satellites, such as NOAA’s GOES, revolutionized the ability of meteorologists to track cyclones," the map-makers explain. "Not a single storm is missed as these eyes in the sky provide consistent scans of the globe every few minutes."